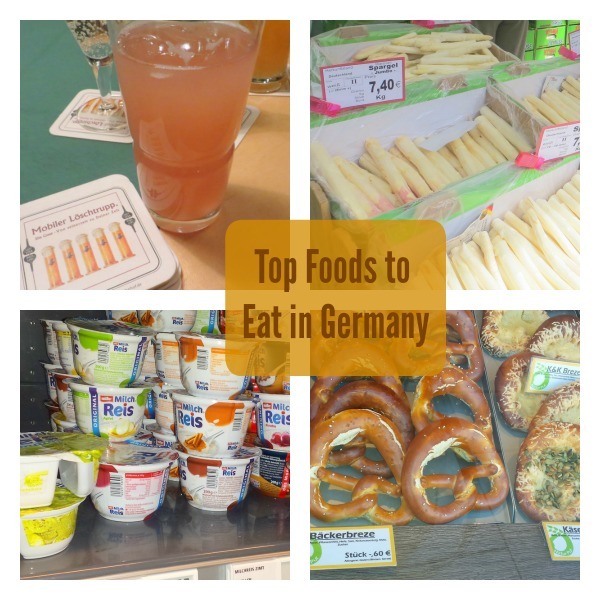 What not to miss tasting if you travel to Germany – or search out locally for a taste of modern Germany. International travel isn’t the typical post from me these days. 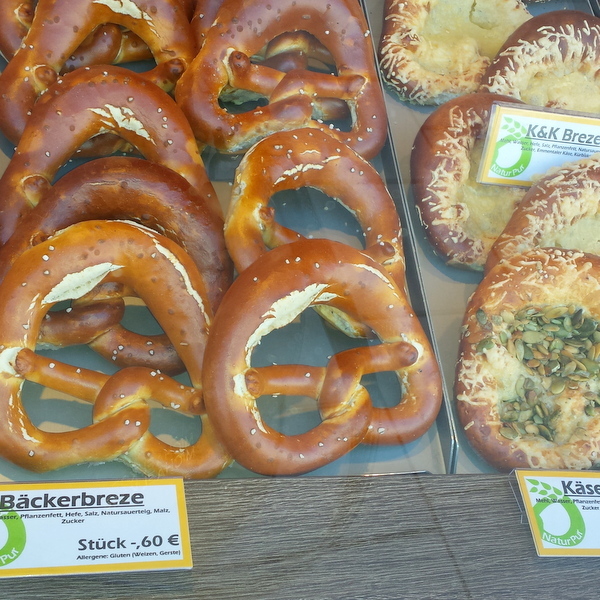 But I wanted to share all the beautiful, wholesome food I was was lucky enough to enjoy on a recent jaunt to Germany. My husband and I spent four nights in Deutschland earlier this month to celebrate our 15th anniversary (and nearly 15 years of saving frequent flyer miles to FINALLY get a free international ticket.) And even more spectacular, I turned off my phone for 5 days. While I’d certainly recommend Germany as a healthy and gorgeous vacation spot – turning off your phone is a vacation I’d give a gold star to any day! 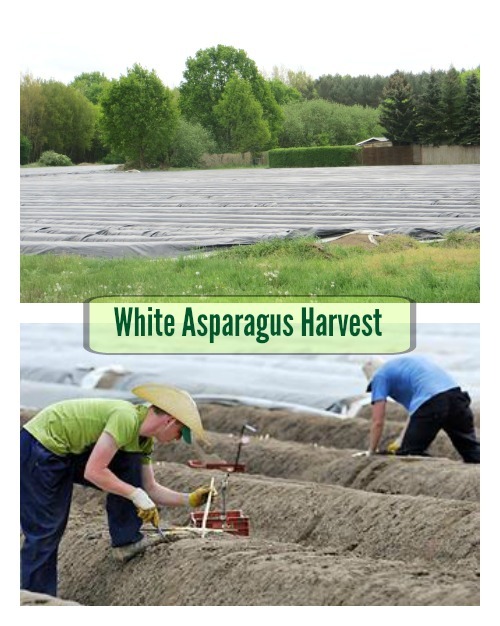 Early May through June is spargel season in Germany and this white asparagus is wildly popular; more so than green asparagus. Make-shift spargel stands are set up in villages large and small. Germans stand in long lines to get the ‘best’ from the small village of Beelitzer. And we happened to drive right by the Beelitzer farm fields en route from Wittenburg to Berlin. White asparagus tastes mild and non-bitter and was on nearly every restaurant menu. Even the touristy Hofbräuhaus House in Munich had one of the most delicious dishes I tasted: Simple steamed white asparagus drizzled in a chive vinaigrette served with crusty rye bread. Spargel dessert! Warm white asparagus vanilla compote with rhubarb ice cream (totally not my husband’s ‘thing’) but I loved the warm/cool contrast. Like most European countries, even the plain yogurt is swoon-worthy creamy and in flavors that really taste like natural fruit. It’s a bit runnier and much less cloyingly-sweet than many brands here. And wow, the varieties: Gooseberry, passion fruit, prune with museli, pure vanilla with the tiniest flakes of real milk chocolate, red lingonberry with raspberry. 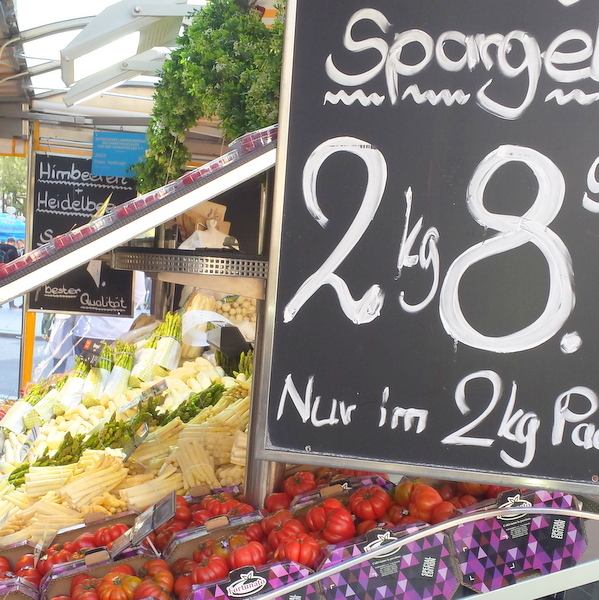 An amazing variety of dried fruit is even available in German supermarkets: Dried kiwi, gooseberries, ground cherries, strawberries, tiny figs, sugared & salted plump blueberries, pineapple, and several different apricots. 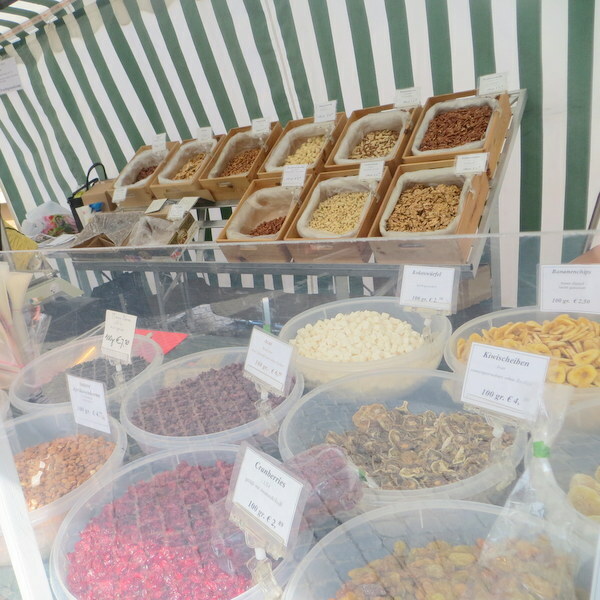 I noticed much of it came from Turkey – which I’ve heard is dried fruit heaven. Not surprising, but not to be missed. 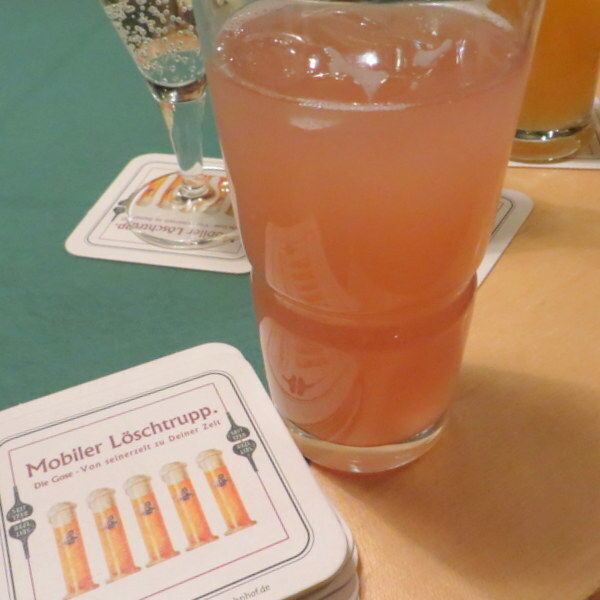 We loved the sour fruit gose – a traditional beer from Leipzig that’s recently been resurrected by the local GoseBrauerei. It tastes a bit like our American Blue Moon with an orange slice – but a bit more tart-sour, more opaque and less hoppy. Luther Ale is a local brew from Whittenburg that’s totally toasty and dark, but not bitter. Chewy, flavorful and just lightly salted pretzels were available everywhere from bread baskets in restaurants to airport shops. I loved the whole grain varieties available even at chain bakeries topped with pumpkin seeds and flax seeds. Lunch: Veggie-packed salad topped with lean meat (even big, strong workmen we saw were eating large salads at lunch) or a moderately-sized sausage in a tiny slice of bread. 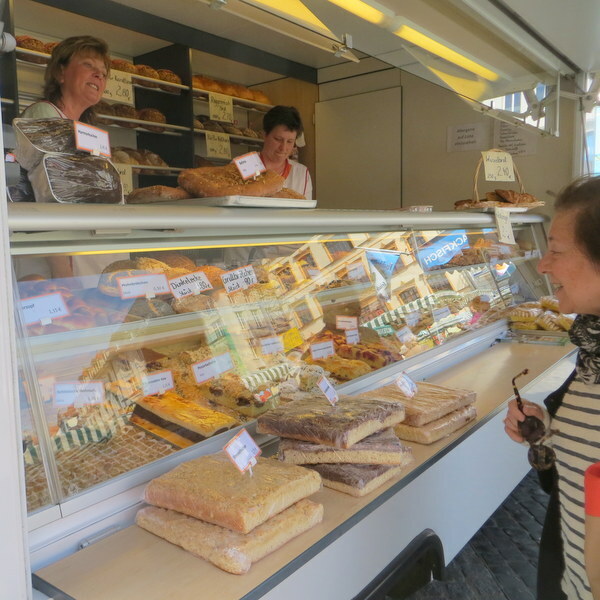 Afternoon CAKE: Beautiful fruit or cream filled cakes decorated the windows of cafes, bakeries and food trucks. But the flavors weren’t overly sweet or topped with mounds of frosting; instead fruit filling or egg custard was bursting from a thin top and bottom layer of light chiffon cake. We tasted moderately-sizes slices of rhubarb custard, poppy seed cream, apple filled with vanilla cream, rhubarb jam, and ‘fruit of the forest’ a jewel-red compote of raspberries, blackberries, strawberries and lingonberries. Dinner: Salad, soup or smaller sausages with sauerkraut. I found several varieties of sausage that were leaner, flecked in green herbs and delicious. Now that’s a ‘eating plan’ I could endorse: Lots of veggies, a good amount of protein and dessert every day! What’s your take on German food? Have you ever been or is Germany on your travel bucket list? What a great post! 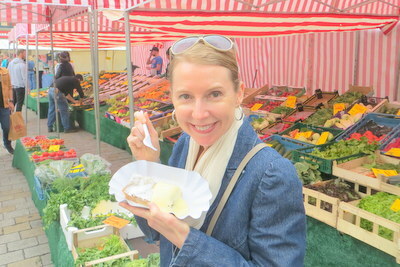 I’m adding it to my Real Food Travel board on Pinterest. My husband lived in Germany for several years as a child, and he really wants to take the family over to visit. 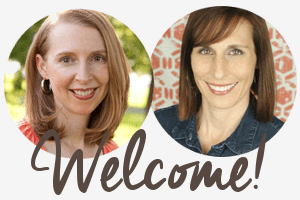 This is a great resource for us! Oh, Annemarie, I hope you get to take your kids. My husband and I want to take the kids some day soon. It’s such an interesting country for kids as so many ‘important history’ happened not terribly long ago – easier for them to comprehend!. Hopefully we can go sooner than another 15 years …we’re saving frequent flyer miles like crazy! Happy Anniversary! Good for you and your husband for taking a trip without kids— to Europe nonetheless! I’m pretty sure I would try all of these foods and enjoy them [especially the beer and pretzels]. I loved all the ideas, when I complete this on my bucket list, I will try all that you suggested, thanks for shareing. Thanks Bonnie. Hope you get get a chance to go! Bet you’d like seeing all the beautiful fields of canola blooming yellow. I love it! You are pretty spot on. We don’t see a lot of dried fruit in this region. They love their carrots, cabbage, and brats here as well. Strawberry season is right after spargel and it’s a big deal too. I don’t think they could live without schnitzel or Italian food either. The Mosel region boasts the best Riesling in the world to me. So glad you enjoyed your trip! Happy Anniversary! Great tip on the Mosel region Riesling Betsy! So true Germans love Italian food…We saw asparagus on every Italian menu too! 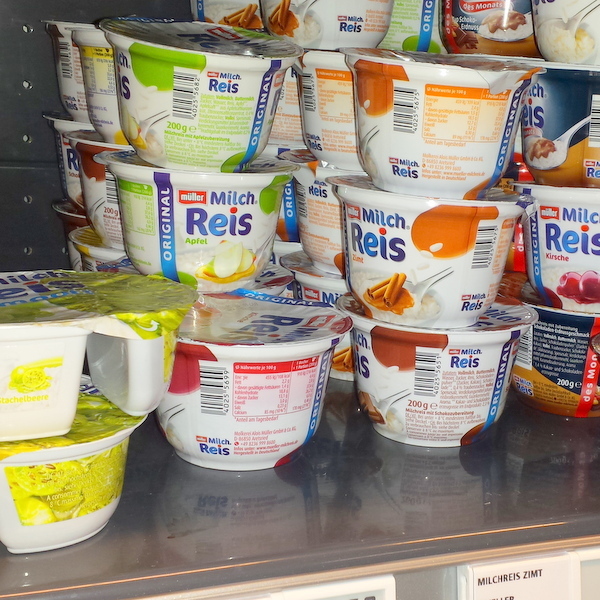 Your Globus German supermarket post is a GREAT resource too! Love the #armchairtravel to a German supermarket! Try it Joanne. You’ll like it! (: Start slow: 2 days then more. 5 days was a big step for me! What a great trip! I’ve been wanting to go to Germany (and Austria). I’m saving up those frequent flier miles (and hotel points) too! Oooo Austria is totally on my bucket list too, Anne. Hope you can go soon so I can read about your adventures and Austrian cheese…heard it’s wonderful! Happy anniversary! how wonderful you got away. And sounds like you got your fill of Spargel 😉 I love learning about the food in other countries – so much fun!